How long can you go? In Central Oregon, you can creep pretty deep, hundreds of feet down into dizzying riverine chasms. Canyoneering is a lot like climbing mountains except the descent comes first. Hiking partner Bob Speik, who never has tongue too far from cheek, often says the main drawback to mountaineering is the elevation gain. The same can be said for scrambling down ultra-steep, rock-strewn canyon walls, except in reverse. I joined Speik, Paul Chance and Joy Newhart Friday for an adventure in the Deschutes River Canyon between the mouth of Squaw Creek and Lake Billy Chinook. If you've not seen this country, adjectives are a poor substitute. But they're all I have. Rugged. Craggy. Declivitous in spots. Downright precipitous in others. With its rimrock defiles and ochre walls scoured by ancient currents, the gorge is a landscape for the ages. One moment you're walking along a flat desert of sage, bunchgrass and juniper, the next you're at a standstill, confronted with big air and a distant ribbon of blue at the bottom of the yawning hole. My companions were there to find a geocache, aptly known as The Hole of Inaccessibility, said to be stashed way down there along the river bank. The three of them are heavily into the adventure/navigation game and came equipped with the requisite GPS units, maps and computer printouts. I was there to relish the smell of juniper on the breeze, to taste the tang of sweat, to feel the burn of neglected muscles put to hard use, to listen to the river sounds. Come to think, my treasure hunting friends were there for the exact same reasons. The challenge begins at the beginning - finding a break in the rimrock cliff where you can make it down to the steep (but navigable) hillside below. We found our break- a place the geopundits have labeled Smokey's Gate because of a bear shaped rock formation there - and got about the business at hand. Which was to scramble down the hill while making sure that we didn't go out of control, stumble and do a high-velocity face plant. Our cross-country ramble took us into a dry stream bed, past a waterless waterfall and down a quarter mile or so to the mighty Deschutes, raging now with spring runoff. According to those who have gone before, The Hole Of Inaccessibility Cache is along the trail in the roughly half-mile section between the mouth of that dry creek and Squaw Creek upstream. We had eight eyes, three GPS units, a constellation of satellites and a unified desire to succeed. But we never found the cache. Not that we came up empty. We got to see a half-dozen golden eagles, hundreds of colorful caterpillars enjoying their spring incarnation, a coyote, delicate paintbrush spangling the slopes and a section of the Deschutes that few see up close. Never one to admit defeat, Speik returned to the canyon Monday and found the cache not far from where we had been looking. Our ascent back out of the canyon was more than just a long, steep haul. We succumbed to that siren song of day trippers, the seductive, all-tempting shortcut. Even though we knew they almost never work out, that we carried no ropes and had no way to scale an intermediate barrier of rock, we bee-lined up the hill in search of a slot in the basalt that didn't materialize. So we angled back down and retraced our steps. A great big word of caution: this trip (and others like it) is not for every one. 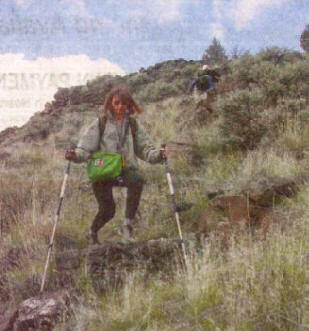 Only reasonably fit, well-prepared and experienced hikers should attempt it. Pack plenty of water and, as the weather warms, keep a sharp eye out for rattlers. 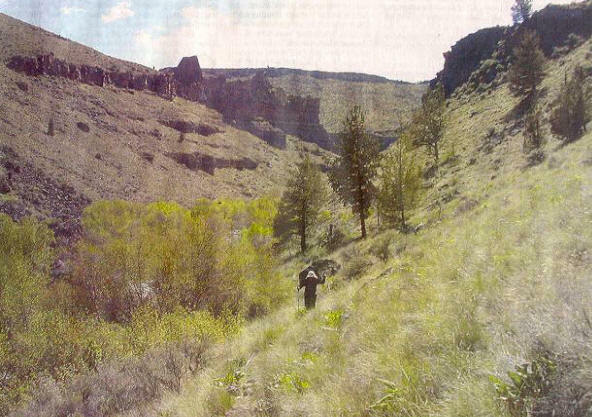 To reach this section of the Deschutes River Canyon, drive to Lake Billy Chinook via Culver, cross the Deschutes and Crooked River arms of the lake and top out on the other side. Drive straight on to the gravel roadway when the road makes a sharp right turn toward Perry South Campground. Follow Forest Road 63 to a Forest Service sign and a gate on the left at Geneva. It's about three miles to the gorge from here. For those with GPS units, the coordinates for Smokey's Gate are N 44 27.902 W121 20.522.
and read more stories like this!